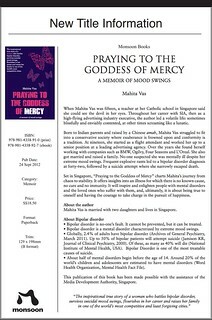 Rambling Librarian :: Incidental Thoughts of a Singapore Liblogarian: Book review: "Praying to the goddess of mercy: A memoir of mood swings"
Book review: "Praying to the goddess of mercy: A memoir of mood swings"
There is power in knowing a name. When it comes to an illness, knowing what it is called allows for some measure of rationality. We can start making sense of it and adopt ways to cope. The term "Bipolar Disorder" (or the cruder term, "Manic Depressive Psychosis") has always been merely words to me. I mean, I understand what it is from reading definitions and articles. But I think nothing becomes real until we associate it with someone or something that we can relate. If I come across the term again, I would think of this 200-plus page story, and a woman named Mahita Vas. "Diagnosed with bipolar disorder at the age of forty-two, Mahita survived suicidal mood swings, flourished in her career and raised a family while battling the mental disorder. Throughout her career as a flight attendant with SIA, then as a high-flying advertising industry executive with companies such as BMW, Ogilvy, Four Seasons and L’Oreal, the author led a volatile life: sometimes blissfully and enviably contented, at other times screaming like a lunatic. 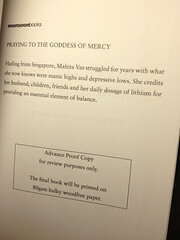 Set in Singapore, Praying To The Goddess Of Mercy charts Mahita’s journey from chaos to stability. Ultimately, the memoir is about being true to oneself and having the courage to take charge in the pursuit of happiness." I was intrigued and said OK to the book review request. The book came in the mail. I took about three days to read it from cover to cover. The short-take: It's pretty good stuff. As a memoir, the author came across as credible and honest, without being self-indulgent. As a book about Bipolar Disorder, it's insightful with specific and personal examples of discovering and coping (or at times, not being able to) with the illness. The writing is crisp. The flow was good, such that I was easily led from page to page all the way till the end. From reading similar works about people living with mental illness (biographical or otherwise), there seems a rough pattern to their experiences: Normalcy, Uncertainty (of what is plaguing them), Diagnosis/ Discovery, Rejection/ Fear, Acceptance. In a way, I expected this book to be no different. So what could be new or insightful, I wondered. After the first few pages, it was clear there is always something new, something different and insightful when it comes to reading about another person's journey in living with an illness. It also occurred to me that most of us would ONLY bother to find out more about a medical condition when it directly affects us, or a close family member or friend. In a way, this book has personified Bipolar Disorder for me. It came across as a coming-of-age personal story about discovering and living with that medical condition. In some ways, I thought her story was also of how others in her life -- particularly her husband and her children -- have had to deal with her illness, before she was diagnosed. By the end of the book, I had the impression this was someone who had come to terms with her situation and herself. Bipolar Disorder, as explained in the book, is not something that can be cured. It cannot be prevented but it can be treated. Back in the 1980s, when the author was in her teens, mental illness was something that was even less discussed or publicly acknowledged. The stigma of having a mental disorder was a much stronger one. Her symptoms of Bipolar Disorder included extreme mood swings -- periods of energy, happiness and invincibility and then inexplicably of sadness, over-reactive outbursts and rages. Even feelings of being unconcerned about death. She described several specific incidents where she raged out of control, for situations that did not seem to warrant the severity of the anger. After the violent outburst, she would feel a sense of guilt and remorse. She described episodes of self-loathing for not being able to control how she has acted. Those episodes were initially accepted as part of her personality (bad temper and unpredictable nature) and a normal life cycle. A breakthrough came when she decided to consult a psychiatrist. Things did not go smoothly for her. The demands of work, family and managing an illness took its toil. It did not help that she decided to adjust the dosage of medication on her own. There is frequent mention of the support from her husband and her children. Once again, this book testifies to the need and importance of support and understanding from family, friends and colleagues when one is coping with an illness. 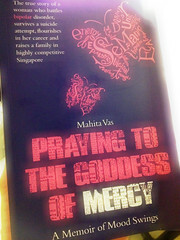 I appreciated how Mahitas Vas did not make excuses for herself nor subject the reader to a self-indulgent confession. Even after a confirmed diagnosis, she wondered just how much of her outbursts were due to her illness and how much was a lack of self-discipline. The last chapter of the book scratched just a little of the surface of this question. The book would be great for a book discussion. In reading this memoir, I had vague echos of Pirsig's "Zen and the Art of Motorcycle Maintenance" going on in my head. In dealing with an illness, there seems to be natural themes of Consciousness and Choice. Something that I thought Finding Ben also dealt with. I thought this book was a good read. We read life stories like this, to remind ourselves that there is always some measure of choice over one’s ‘fate’. Monsoon Books is officially launching the book on 24 Sept, Oct 2012. The e-book is already out on ilovebooks.com. The author has a website and Facebook page.